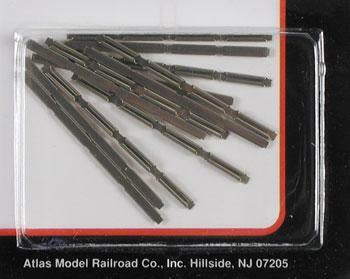 This is a Set of N Scale Rail Joiners made by Atlas. "If you&apos;re using Atlas track, use Atlas rail joiners"
You have many choices in flex track. Should you choose Atlas as many do, make sure you use Atlas rail joiners of the same code. Although all model railroad rails are very similar, there are minor differences. Using Atlas joiners with Atlas track will make your job so much easier. Before attaching the joiners, remove at least 2 ties on both ends of the track to be joined. Make sure your meeting rails are centered on the joiners (see pictures). Only solder on the outside of the rails. Don&apos;t overdo the solder. Use flux to ensure that solder covers both rails and the joiner. When placing the last piece of track in the circuit against the first piece laid, push the joiners all the way back on the first piece. Remove extra ties if necessary. When you have cut the last piece of track to length, drop them in front of the first piece of track and slide the joiner to the center. This same technique can be used to replace a broken turnout or damaged section of track on a completed layout. To be used with N scale track.